Item Number: 810-2-11G 19561 Actual Weight: 0.6 lb. 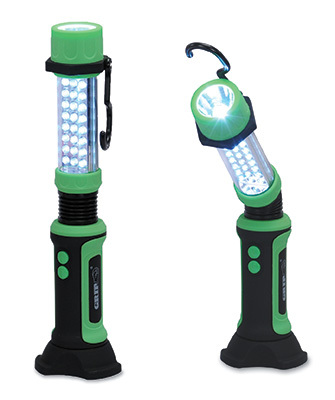 Flexible 25 LED work light can be used as a spotlight or 24 LED work light. Use built-in hook to allow light to hang or use magnetic bottom to attach light to any ferrous surface. Easy to hold, non-slip rubber grip. Light output – 50 Lumens (work light), 40 Lumens (top, spotlight). Includes 4 AA batteries.